Bass Guitar Practice--Fast Alternate Picking This lesson presents three exercises designed to improve your picking speed. Before we start, you WILL need a METRONOME! If you don't have one, Here is a relatively inexpensive one that will help you with your practicing. It is really a mini drum machine! For these exercises, you can start with the metronome set at 60 beats per minute (or slower if you need to). IMPORTANT NOTE: You need to use "alternate picking in all of these exercises. In case you don't know, "alternate picking" means that you pick one note DOWN and the next note UP. If you try to do the exercises using only "DOWN" picking, you will be wasting half of your picking motion and the result will be that you will play HALF AS FAST as if you use alternate picking. **Before you begin to play the exercises, you might want to set your metronome at 60 and practice clapping each rhythm--2 notes per beat, 3 notes per beat, 4 notes per beat and 6 notes per beat. **If 60 seems very slow for the eighth notes, leave it there until you try the other three rhythms. Three, Four, and six notes per beat might be faster than you think. 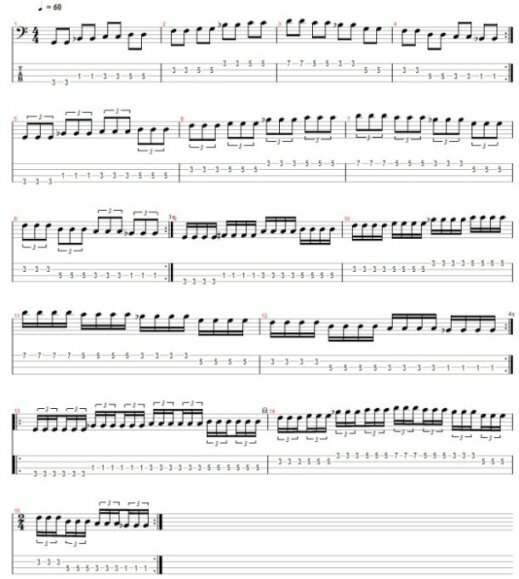 **Here is how to play it: Play the scale (I used "pentatonic minor" for the example, but you can choose any scale that you want to practice) using eighth notes--2 notes per metronome beat. Repeat this part of the exercise until it becomes easy. Then practice the triplets--3 notes per metronome beat. Practice these triplets until you can play them smoothly and evenly. Next comes the section of 16th notes--4 notes per metronome beat . Again, repeat this section until it becomes easy. If you find the 60 is too fast at first, just slow the metronome down a bit. Finally come the 16th note triplets--6 notes per beat. If 60 is too fast, SLOW IT DOWN. It is important to practice at a speed which you can play PERFECTLY. Be Patient and be Faithful about your bass guitar practice. You will be amazed at the results! Perfect Your Bass Guitar Practice!